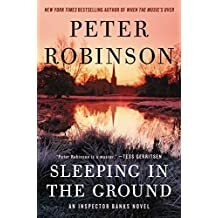 Sleeping in the Ground by Robinson – Joyce's mystery and fiction book reviews with some non-fiction too! I just finished reading this book for which I had paid the full e-book price a while back. It is currently an e-book bargain. I have read and enjoyed all of the novels in this author’s Inspector Banks series. The principal characters are well developed and the plots are generally involving. The lives of the main protagonists change over time so there is the added bonus of catching up with their lives in each book. Sleeping in the Ground begins with murders by an unknown sniper at a village wedding. By the end of the book, the reader will know what happened and why. However, for me, the mystery in this one felt less important than what was happening with Alan Banks. Alan has learned that his first sweetheart has died. This leads him to reminisce about his youth and to contemplate how we all change as we grow older. There is an elegaic tone to this contemplation. I have always wanted Banks to be ageless and for the series to continue for ever but this one has led me to think that this may not be the case. I will not worry too much yet though as another in the series is to be published soon. This is a series that is over 20 books strong. If you read one, you may just need to read them all.